The incoming chair of the House Democratic Caucus confirmed Wednesday morning his party would vote for billions in additional funding for border security and touted the "enhanced fencing" the bill would include. 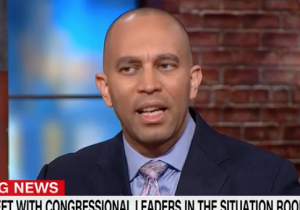 Speaking with CNN's John Berman on "New Day," Rep. Hakeem Jeffries (D., N.Y.) discussed the newest effort to break the shutdown, now in its 12th day. On his part, Jeffries touted a bill which would provide for enhanced border security, but fall short of President Donald Trump's $5 billion demand for a wall qua wall. Instead, Jeffries promised $1.3 billion, some for "enhanced fencing." "Well, in the bill that we're going to put on the floor tomorrow," Jeffries said, "we're going to allocate $1.3 billion in additional funding to allow for enhanced technology, cell phone towers, satellites, drones, enhanced fencing, increased communication capability, the things that the experts have said are necessary to improve border security. We also want to make sure that we can conduct ourselves in a humane fashion on the border. Never again should we see two young innocent children killed on the border in U.S. custody." Berman asked Jeffries whether the offer of "fencing" could eventually satisfy Trump's demand for a wall of "steel slats," and whether the makeup of the wall was of any consequence. "At the end of the day, what is the difference between enhanced fencing and a concrete wall?" Berman asked. Jeffries took issue with the cost of the wall, calling Trump's proposal "medieval" and "ridiculous." Nevertheless, he granted that the areas currently walled or fenced off were in need of repair. "There are areas along the border where there are currently fences that are put up or barriers that are put up that need to be enhanced and, consistent with what the policy experts have said, are helping to improve our security along the border," he said. "Does that mean any new fencing?" Berman asked. "Could you support any new fencing?" Jeffries agreed Democrats would consider building a barrier along parts of the border currently unsecured, taking issue only with the cost. "We will have to see what the particulars are as it relates to the justification for advanced, additional fencing along a 2,000 mile border. But in terms of a political promise that Donald Trump made during the campaign and is trying to now extract from the American taxpayers, that's completely unreasonable." Trump is set to meet with Sen. Chuck Schumer (D., N.Y.) and Rep. Nancy Pelosi (D., Calif.), who is expected to be the next speaker of the House, on Thursday. Jeffries sounded an optimistic note about the upcoming meeting, calling it "a modest step in the right direction."